The overall health of Palma Sola Bay was again very good in 2016. Mean values for nitrogen and chlorophyll a concentrations were below their target values, and while phosphorus concentrations rose sharply late in the year, the annual (geometric) mean value was still below the regulatory threshold. Water Quality: As it did in 2015, Palma Sola Bay retained its “Pass” rating as all three water quality indicators (chlorophyll a, nitrogen, and phosphorus) were below established thresholds. The mean concentration for chlorophyll a nearly doubled from the previous year, but its mean value of 0.0072 mg/l was still well below the target value and slightly below the historical average for that water quality measure. Mean nitrogen concentration again increased, to 0.78 mg/l, due largely to a sharp increase late in the year. However, nitrogen is still below the target of 0.93 mg/l, so its rating is "Good". Phosphorus concentration showed slight improvement, decreasing to 0.121 mg/l and bringing it below the target value so that ts rating was upgraded from "Good" to “Excellent”. The mean for chlorophyll a was calculated as an arithmetic mean and the means for nitrogen and phosphorus were calculated as geometric means (per the Numeric Nutrient Criteria outlined in the Florida Administrative Code, section 62-302.532). Biotic Indicator: Measurement of the biotic indicator, seagrass, was last performed in 2016 by the Southwest Florida Water Management District. 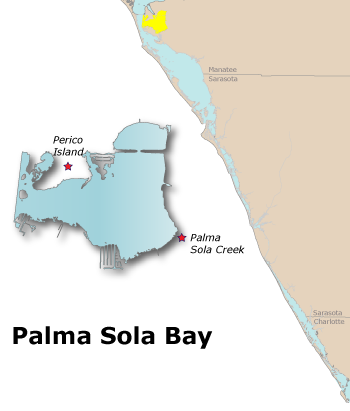 The total area of seagrass in Palm Sola Bay increased very slightly from the 2014 assessment and is now estimated to be 1,569 acres, one and a half times the target acreage of 1,031 acres.